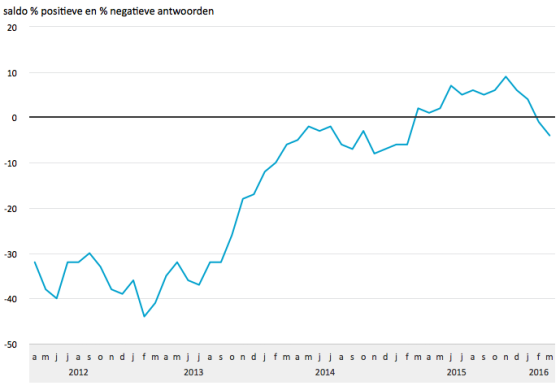 The Dutch consumer confidence index fell further into negative figures in March, national statistics office CBS said on Friday. The index dropped to -4 this month, compared with -1 in February. Until then sentiment had been positive for almost a year. The decline is due to increasing pessimism about the Dutch economy, meaning the Dutch are less willing to make major purchases, the CBS said. The index reached an all-time low in February 2013, when it plunged to -44. It’s high point came in April 2000, when it reached +27.